Its been 6 years now since we first began the South Phoenix light rail conversation. 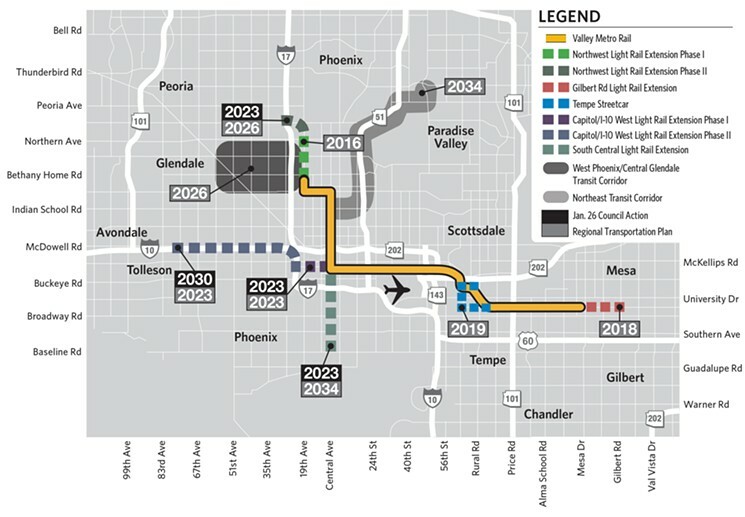 The 5.5 mile extension would run down Central Avenue from Washington Street to Baseline Road and connect South Phoenix to Downtown. After voters approved Proposition 104 in 2015, a $31.5 billion transportation plan, the city put the nearly $1 billion project on a fast track. So what’s the problem? More light rail means easier access to an area that could really use public transit. In order for the expansion to work with bike lanes, landscaping and the addition of the light-rail, the city would have to demolish 50 buildings along the 5-mile stretch. Rather than do that, Valley Metro CEO Scott Smith and the city council decided to move forward with a different configuration that will take Central Ave. down to two lanes along the expansion route. This is a huge issue for many business owners along Central Ave who feel the increased congestion will deter drivers and cost them business. Many other sections of the light-rail require a reduction in traffic lanes, but this area and Downtown Mesa will be the only areas reduced to two lanes. Confusion has also arisen as to who knew about the reduction in lanes. Some business owners are claiming they were not informed about the loss of lanes on Central Ave. and have organized a group called “4 Lanes or No Train”. These business owners feel they were not accurately informed by Valley Metro. Although they received many invitations to discuss the project between 2012 and 2018, none of the notices explicitly explained the lane reduction. So where are we now? After much public outcry, Valley Metro presented two alternatives: a two-lane plan and a four-lane plan. On September 26, the Phoenix City Council voted to move forward with the two-lane design.